Three Republican Representatives, Mick Mulvaney (SC), Jim Jordan (OH), and Steve Scalise (LA), sent a letter on Thursday to House Speaker John Boehner (R-OH) and Majority Leader Eric Cantor (R-VA) advocating to keep spending in any agreement that results from the current budget conference at the sequestration level of $967 billion in 2014. Their letter has 19 other signatures so far and lawmakers can sign un until Monday. Other Republicans have been worried about sequestration’s cuts, particularly to defense spending. Reps. Jim Bridenstine (R-OK) and introduced a bill this week that aimed to cancel sequestration cuts to the Department of Defense for the next two years. And Rep. Paul Ryan’s (R-WI) negotiations with Sen. Patty Murray (D-WA) look set to yield a higher spending level closer to $1 trillion for next year, which would cancel sequestration’s cuts to programs while keeping its deficit reduction through higher revenues from increased fees. “Most Republicans — conservatives and moderates alike — are hoping Ryan and Murray succeed, because they believe sequester level spending is unsustainable,” Jake Sherman writes in Politico. But Mulvaney, Jordan, and Scalise aren’t the only Republicans who have come out in favor of keeping sequestration. While Republicans originally tried to pin the blame for the cuts on President Obama, at least eight others have said that they’re a good way to cut the budget and something they want to keep. House Republicans also released a budget plan in July with even deeper cuts, although when it came time to implement the specifics so many balked that it didn’t get a vote. Yet they again made sequestration a baseline leading up to the government shutdown by passing a continuing resolution at those levels in the House. Sequestration’s damage had a wide-ranging effect this year, impacting the elderly, cancer patients, low-income renters, domestic violence survivors, the homeless, preschool and K-12 students, scientists, the long-term unemployed, and Department of Defense workers, among others. It also reduced economic growth and consumer spending. Yet things get even worse next year if the cuts stay in place, as many of the accounting gimmicks and emergency measures departments took to dampen the blow will no longer be available. The damage compounds the longer the cuts go on. On the other hand, the deficit would look better if the cuts were cancelled and the economy could add as many as 1.6 million jobs and 1.2 percent to GDP growth. The health industry is about making money, not healing. It’s great living here in our rich country, as long as you’re rich yourself. Take our health care system. Unlike other wealthy countries, our nation’s medical apparatus allows those at the top to receive top-notch care, while the working class has to scrounge to survive. If you’re lucky enough to obtain coverage in the first place, you’re then confronted with a tangle of red tape. Doctors, clinics, hospitals, nursing homes and drug companies vie for our business with inadequate oversight. But what if your coverage expires or the cost of your care exceeds policy limits? Tough luck. Meanwhile, the lucky among us continue to live longer and add to the national health tab, increasing Medicare costs. But in this era of corporate obsession with efficiency, the health care system is a paragon of waste. Instead of a streamlined system, every insurance company operates according to its own prerogative. Doctors’ offices are now filled with more clerks than white coats. In 2011, American doctors spent $27 billion more on bureaucratic paperwork than our Canadian neighbors operating under a single-payer system. Canadians, like most everyone else in rich countries, appreciate their universal care and scratch their heads in disbelief at our nation’s medical free-for-all. Another of our mind-boggling ineptitudes is that we pay medical providers according to how often they see us and the procedures they perform. They should earn more for keeping us healthy than simply treating our ever-rising number of ailments and administering increasingly pricey tests. With no incentive to get the job done right the first time around, savvy docs set up their own clinics to refer us to, while hospitals load up on snazzy equipment to test us excessively. Many of the CEOs of our nation’s top hospitals rake in salaries well over the million-dollar mark. The health industry is about making money, not healing. And it’s a big business. And let’s not forget the drugmakers. Their wares are keeping us alive longer too, if we can afford them. But keep in mind that their industry spends more on marketing than it does on research. One study found that for every $19 Big Pharma spends on advertising and marketing, only $1 goes to funding basic research. And our rigid patent system favors these medical moneymakers by granting drug developers patents for 20 years. This allows companies to jack up drug prices and prevents low-income patients from accessing cheaper alternatives to drugs they depend on. The FDA also makes it illegal for individuals to purchase prescription drugs abroad at much lower prices. But one thing the medical mob can’t yet keep you from doing is seeking treatment and procedures in other countries. Asia and South America have become hotbeds of American medical tourism. And if we are allowed to travel to close-by Cuba and use its state-run health care system in the future, you can bet we’ll flood that country too. As always, those at the bottom of the economic ladder are hit the hardest by the health industry’s incompetency. If you’re poor, maybe you qualify for Medicaid, or maybe you don’t. Maybe there’s a neighborhood clinic near you, or maybe not. Maybe you’re fortunate enough to be healthy, or maybe you inherited a gene that triggered a costly chronic illness. President Barack Obama’s Affordable Care Act is already helping people obtain or maintain health insurance and by January 1, 2015 it’s supposed to be fully implemented. But don’t get too excited — an estimated 26 million Americans will remain uninsured by 2020, according to the Congressional Budget Office’s calculations. Would repeal the 2010 healthcare law. It’s the GOP response to the Supreme Court ruling on the law. The House Rules Committee is expected to consider this bill on Monday evening in an “emergency meeting” because the bill will be officially introduced on Monday by Majority Leader Eric Cantor (R-Va.). The House is expected to vote on the bill on Wednesday, July 11. Republicans in the house have gone overboard this session mandating that each and every bill must specify “pay-fors.” A repeal of “Obamacare” would pose a $230B increase in the budget deficit. Watch to see if hypocrisy prevails and whether Rep. Eric Cantor (R-VA) identifies ANY “pay-fors” as part of his repeal effort that is going absolutely NOWHERE. Aimed at streamlining the process for approving mining rights, and addressing what many see as an increasingly U.S. reliance on imported rare earth minerals that are key to manufacturing and national security. Increases, effective as of Dec. 1, 2012, the rates of compensation for veterans with service-connected disabilities and the rates of dependency and indemnity compensation for the survivors of certain disabled veterans. Directs the head of each Federal department and agency to treat relevant military training as sufficient to satisfy training or certification requirements for Federal licenses. HR 4367 amends the Electronic Fund Transfer Act to limit the fee disclosure requirement for an automatic teller machine to the screen of that machine. Enhances the use of Juvenile Accountability Block Grants for programs to prevent and address occurrences of bullying and to reauthorize the Juvenile Accountability Block Grants program. The Small Business Jobs and Tax Relief Act (S 2237) – The Senate will hold a procedural vote on this bill Tuesday afternoon. This bill (#6 on POPVOX) would reduce corporate taxes on the first $5 million in wages paid in 2012 over 2011. Requires a report on the designation of the Haqqani Network as a foreign terrorist organization. Provides for an exchange of land between the Department of Homeland Security and the South Carolina State Ports Authority. The Supreme Court ruling in favor of the healthcare bill prompted the introduction of several bills to repeal the law, none of which appear likely to advance because of the pending House vote on Cantor’s bill. Repeals the provisions of the Patient Protection and Affordable Care Act and the health-related provisions of the Health Care and Education Reconciliation Act of 2010 not declared unconstitutional by the Supreme Court from Rep. Connie Mack (R-Fla.). Amends the tax code to repeal the individual and employer health insurance mandates, from Rep. Michael Turner (R-Ohio) and more than 100 other cosponsors. Prohibits funding to implement any provision of the Patient Protection and Affordable Care Act or of the health-related provisions of the Health Care and Education Reconciliation Act of 2010, from Rep. Connie Mack (R-Fla.). Recent results from the National Center for Health Statistics show that the number of children with health insurance has continued to climb over the past 3 years since the reauthorization of the Children’s Health Insurance Program (CHIP) in February 2009. 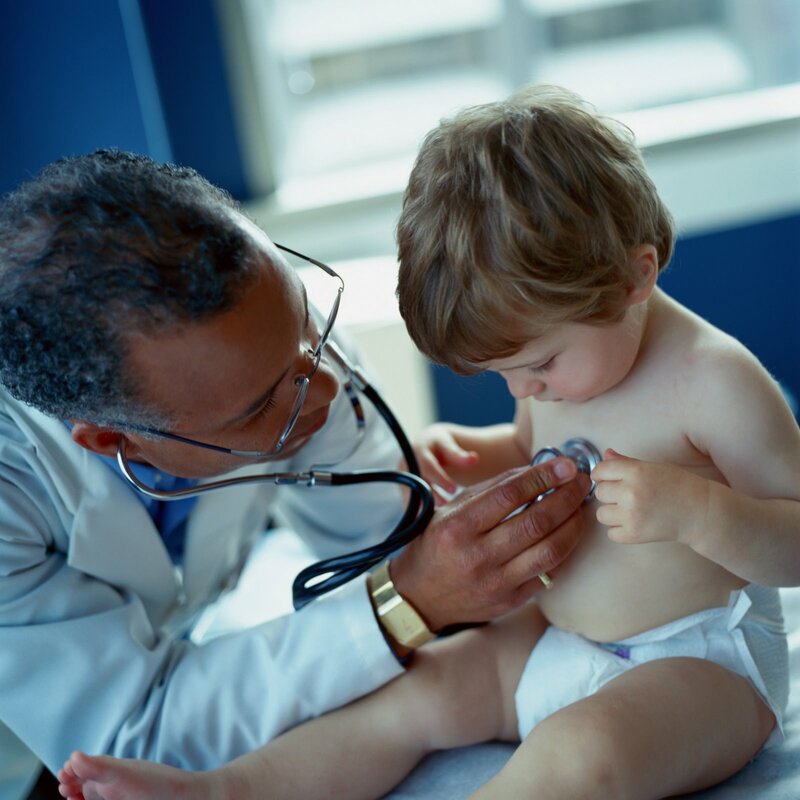 In 2008, prior to the reauthorization of CHIP, 91% of all children had health insurance coverage. This number has increased to nearly 93% in the first half of 2011, corresponding to an additional 1.2 million children with insurance. This increase has been entirely due to greater enrollment in Medicaid and CHIP. 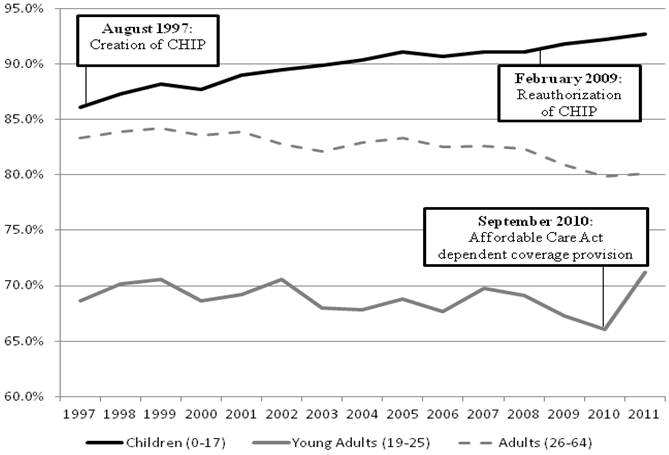 Since CHIP’s creation in 1997, the percentage of children ages 0-17 with health insurance has increased from 86% to 93%. Meanwhile, during the same period, the percentage of adults ages 26-64 with insurance has fallen from 83% to 80% Figure 1. Given these opposite trends, it is clear that expanded insurance options for children have been the difference. The Children’s Health Insurance Program Reauthorization Act (CHIPRA), signed into law by President Obama in 2009, featured several provisions designed to increase enrollment in Medicaid and CHIP, including a new Express Lane Eligibility process that allows States to enroll children using information from other public programs; automatic eligibility for newborns whose mothers are covered by Medicaid or CHIP; and a new Performance Bonus for States implementing multiple policies to simplify enrollment and expand coverage for children. In addition, the federal government boosted its share of Medicaid and CHIP payment to States as part of the American Recovery and Reinvestment Act (ARRA) of 2009, which helped States maintain public coverage for children. The recent numbers from the National Center for Health Statistics suggest that these approaches have produced continuing gains in health insurance for America’s children. These results come from the same survey showing 2.5 million young adults have gained health insurance as a consequence of the provision in the Affordable Care Act that allows individuals to remain on their parents’ insurance plans until age 26. Overall, these findings indicate that the two largest pieces of health care legislation passed under the current administration — CHIPRA and the Affordable Care Act — have combined to expand health insurance to 3.7 million children and young adults since 2008. There are 74.9 million children 0-17 years old, as of the most recent Census data (DeNavas-Walt C, Proctor BD, Smith JC. Census Bureau, Current Population Reports, P60-239, Income, Poverty, and Health Insurance Coverage in the United States: 2010, Government Printing Office, Washington, DC, 2011). NHIS data show a 1.6% increase in insured children (91.1% to 92.7%, or equivalently, a decline in the percentage without insurance from 8.9% to 7.3%) from 2008 to 2011. 1.6% of 74.9 million is 1.2 million children. NHIS reports do not provide results for the 0-18 age group, even though 18 year-olds are eligible for CHIP; thus, if anything, 1.2 million is slightly below the true number of children who gained coverage. NHIS reports that public coverage among children went from 34.2% to 40.1% from 2008 to 2011, while private coverage declined from 58.3% to 54.1%, meaning the entire increase in overall coverage came from public sources. Adults experienced a similar decline in private insurance from 68.1% to 64.2%. While public insurance includes Medicare and military coverage, child enrollment in these programs is low and has not increased over the past decade (DeNavas-Walt et al., 2011). NHIS reports insurance statistics for 0-17, 18-64, and 19-25 age groups. We subtracted out the 19-25 age group from 18-64 year-olds to estimate coverage for 26-64 year-olds, meaning that this latter group also includes 18 year-olds (who comprise roughly 2% of that group, and are therefore unlikely to significantly affect the overall trend).